Sir Gilbert Hoghton was a real life figure in the English Civil Wars. He had an eventful time losing his son, Roger in 1643, and his eldest son and , Richard, was fighting on the side of Parliament! The present head of the Hoghton family is Sir Bernard de Hoghton Bt., Honorary Colonel of the present-day Sir Gilbert Hoghton’s Company of Foote. We don’t hold any genealogical data on the Hoghton family but it’s worth looking at the Hoghton Genealogy Group Forum. Originally appeared in the Sealed Knot Magazine – Orders of the Day, Volume 33, Issue 3, 2001 reproduced by kind permission of the author. Hoghton Tower is a large fortified house on a hilltop between Preston and Blackburn. It was built around a medieval pele tower, which originally stood between the inner and outer courtyards of the present house. The ancestral home of the de Hoghton family since the Norman Conquest, Hoghton Tower is one of the most dramatic-looking houses in the North of England. The present house was built almost entirely in the Elizabethan period and is reached by an impressive steep, straight carriageway over half a mile long. Construction was completed by Thomas Hoghton in 1565, but he, a recusant, lived in it only four years before fleeing to the Low Countries, where he died. Thomas’s nephew Richard held rather more politically correct views, and earned the favour of James I, who made him a baronet in 1611. He stayed at Hoghton in 1617 before visiting the home of the Earl of Derby, Lathom House, which was to be the site of the most heroic Royalist defence in the whole of the Civil Wars. Sir Richard laid out the red carpet for James’ visit for the entire length of the half mile avenue leading to the house. The Banqueting Hall, with its Minstrel’s Gallery, is where James I dubbed the loin of beef ‘Sirloin’ in August 1617 and where previously William Shakespeare had started his working life as a tutor. The house still contains the King’s Bedchamber, Audience Chamber, Ballroom and other staterooms used by the King, the Duke of Buckingham and other nobles. There is also a Tudor well house with its horse-drawn pump and oaken windlass, the underground passages with dungeons, wine cellar and the stone cells which housed malefactors and cattle thieves. On the Sunday of the King’s stay at Hoghton Tower he received a petition, signed principally by the Lancashire peasants, tradespeople and servants, representing that they were debarred from lawful recreations upon Sunday, after evening prayers, and upon holy days, and praying that the restrictions imposed by Commissioners in the reign of Queen Elizabeth against “pipers and minstrels playing, making and frequenting bear-baiting and bull-baiting, on the Sabbath days, or upon any other days in time of divine service; and also upon superstitious ringing of bells, wakes and common feasts; drunkenness, gaming and other vicious pursuits”. The King declared such restrictions incompatible with the privilege of his subjects, and offered redress in the form of a proclamation. This declaration formed the basis of “The Book of Sports” issued to all bishops in 1618 to be read and published in all parish churches. The subsequent re-issue of “The Book of Sports” by Charles I early in his reign, antagonising clergy and Parliament, was one of the root causes of the subsequent Civil Wars. King James must have been impressed by the lavish welcome and the feasting which followed. These honours were all very well, but as a result of his great expenditure on entertainment, aggravated by an overdue mortgage on his alum mines at Hoghton, Sir Richard became bankrupt and was imprisoned for a time in Fleet Prison. Sir Richard died in 1630, and was succeeded to the baronetcy by his son Gilbert. On 7th April 1637, the House of Hoghton was honoured by Charles I by a grant to the Baronet and his eldest son of the right to wear special livery, the Hunting Stewart tartan. Sir Gilbert Hoghton was aged 51 at the outbreak of hostilities in 1642, comparatively old for that time, and he was only prominent in the early stages of the conflict. He was an important Royalist in the county, serving as one of the several Deputy-Lieutenants and Commissioners of Array for, and Sheriff of, Lancashire, with responsibility for the Fylde. He also served on the council of Lord Strange, the Earl of Derby, the Royalist Commander in Lancashire. These posts meant that Sir Gilbert was responsible for the raising and equipping of troops on behalf of the King and keeping them in readiness for combat. Furthermore, his position on the Council meant that he was involved in policy-making and the conduct of the war in Lancashire. Hostilities in Lancashire began with the Commission of Array issued to Lord Strange (later Earl of Derby) and Lord Lieutenant of Lancashire by the King on 10 July 1642. It was proclaimed in Manchester on 15 July, resulting in a skirmish and the death of Richard Percivall, a Parliamentarian linen-weaver. Two months later the siege of Manchester was led by Lord Strange at the head of 4300 Royalist troops; Sir Gilbert Hoghton was one of his senior officers. The siege lasted a week, and ended when orders were received to join the King at Shrewsbury to prepare to fight the army of the Earl of Essex. Loyalties in Lancashire early in the Civil War were divided, with the people of Blackburn siding mostly with Parliament. And so, in October 1642, circa 300 men of the Royalist Lancashire Trayned Bandes and clubmen, summoned from the Fylde by Sir Gilbert Hoghton by a signal beacon at Hoghton Tower, marched against Whalley, the home of the Assheton family, where there was a large store of arms as a result of the disarming of Roman Catholics in 1641. Whalley fell without a struggle and Sir Gilbert moved his forces onto Blackburn. Hearing of Hoghton’s activities, Colonel Shuttleworth of Gawthorpe Hall and Colonel Starkie raised a force of 8,000 men and attacked Sir Gilbert’s force by night. After a hard-fought defence, Sir Gilbert and his men fled, leaving behind all their arms. Having lost Blackburn, and as it was so close to Hoghton Tower, Sir Gilbert was resolved to retake it. To this end he brought his force on Christmas Eve to the outskirts of Blackburn. Probably feeling uncertain of his men after their last defeat, he failed to close on the Blackburn garrison, and the one small cannon that they possessed did no damage. At nightfall they retreated so that “they myght eet theyr Chrystmas pyes at home” as the records have it. The only damage that Blackburn sustained was when a bullet entered a house and shot out the bottom of a frying pan. Parliamentarian forces from Manchester, Bolton and East Lancashire under the command of Sir John Seaton assembled at Blackburn in preparation for an assault on Preston, 10 miles away, on the evening of 7th February 1643. The Royalist force at Preston was Sir Gilbert Hoghton’s Dragoons, two or three companies of foot, Sir Thomas Tyldesley’s Dragoons which were in the process of being raised under Captain William Blundell and two troops of horse, under Major Anderton of Tyldesley’s and Captain Radcliffe Hoghton. On the evening of 8th February the Parliamentarians moved against Preston. They managed to cross the River Ribble at Walton which the Royalists had left unguarded, and formed up near the town walls under the cover of darkness. About one hour before daybreak they attacked with about 2500 men. Soon the defences had been breached. The last Royalist reserves were the troop of horse under Radcliffe Hoghton. These were committed to the fight but were ambushed by 20 Parliamentarian musketeers who had taken up position in a house. Radcliffe was killed by their volley and his troop dispersed. Resistance began to collapse and many of the Royalists tried to escape. Sir Gilbert managed to make his getaway to Wigan but his wife was captured. Two or three hundred prisoners were taken, including Captain Hoghton, Sir Gilbert’s nephew. Some six weeks later the Earl of Derby recaptured the town. On February 23rd, King Charles wrote a letter to Sir Gilbert Hoghton saying, “Now that the Rebels seeme to ayme at a more forcible disturbance thereof, repaire unto and continue at your proper Mansion with your family and usuall retinue that others being encouraged and counterbalanced by your good example, you and they may be the better at hand to assist each other for the preservation and defence of the county.” Shortly after the taking of Preston by Seaton, Hoghton Tower was besieged by Parliamentary troops under Captain Nicholas Starkie of Huntroyd. Hoghton Tower at the time held a garrison of only 30-40 musketeers. These defenders capitulated on February 14th, but when the Roundheads entered the house, the powder magazine in the old pele tower between the two courtyards exploded with terrifying force, killing over 100 Parliamentary men. This central tower was never rebuilt. The last act of Sir Gilbert in the Civil War was at Chester in October 1643, where he had been sent to await the arrival of the King’s Irish army. With this force he was probably engaged, with Lord Byron, in the surprise attack on Col. Assheton’s Lancashire regiment. Unfortunately Sir Gilbert does not appear to have been on very good terms with Byron and after a quarrel he appears not to have taken any further part in the action at Chester or indeed in any action at all. His unwillingness to continue the fight was probably also compounded by the loss of his son, Roger, a Captain of Horse under Molyneux and Tyldesley in 1643, as well as by the fact that his eldest son and heir, Richard, was fighting on the side of Parliament. Richard Hoghton was appointed by Parliament in 1644 to the Office of Steward and Bailiff of Crown lands in Yorkshire and Lancashire. By 1647, when he inherited the baronetcy on the death of his father, he held a colonel’s commission in Assheton’s Regiment, the regiment Cromwell referred to after the battle of Preston as “the best pikemen he had seen”. Of Sir Gilbert’s other sons involved in the war, in 1645 Gilbert was appointed by Prince Maurice to a commission as Sergeant Major and Captain in a company of Col. Ratelph Gerard’s Regiment and later became the Governor of Worcester, and Henry was a Captain of Horse under the Earl of Derby. Of course the road through Lancashire, through Preston, past Hoghton Tower, on to Wigan and the south, saw action later in the troubles. There is still, past the Boar’s Head pub in the village of Hoghton a number of cottages called “The Barracks”. These are a reminder of the Third Civil War, when they were used by Cromwellian troops in 1651. Barracks Farm separates the row of cottages from Hoghton Tower. 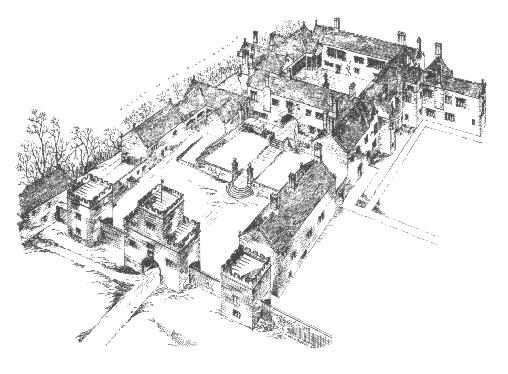 At the Restoration on 8th March 1660 Sir Richard Hoghton was outlawed for his part in the rebellion, fined Â£12.3.4 and the forfeiture of incomes from the Hoghton estates. In June 1660 Sir Richard made a declaration of loyalty to Charles II and petitioned for pardon. In October the Earl of Derby appointed Sir Richard Deputy Lieutenant of the counties of Lancaster and Chester. In May 1661 the King granted pardon for all acts of lÃ¨se majestÃ© in the late insurrections, and later that month Lord Manchester appointed Sir Richard to the office of Gentleman of his Majesty’s Privy Chamber Extraordinary. The present head of the Hoghton family is Sir Bernard de Hoghton Bt., Honorary Colonel of the present-day Sir Gilbert Hoghton’s Companye of Foote. Houghton/Hoghton Tower, also called Ho(u)ghton Castle has been well known in Lancashire for several centuries. The Hoghton family is an old one of Norman descent, with a history dating from 1065. That is when documents show that the earliest Hoghton came over on the same ship with William the Conqueror. The Hoghton coat of arms is the oldest Cheshire coat of arms and the second oldest in England. It’s mainly a shield with horizontal strips going across it and an animal standing above the shield with intricate detail all around it. The latin motto means – “In spite of wrong.” In the 1500s, the Catholic Hoghtons of Lancashire England were underground supporters of Catholicism. These were the days when the Catholic Faith was outlawed. They formed a secret underground society called The Gunpowder Plot. William Shakespeare, Thomas Hoghton his brother Alexander Hoghton, their cousin Richard Hoghton his brother in law Barthotomew Hesketh John Cottom’s, Cottom’s cousin, Thomas Jenkins, Father Edmund Compain , John Finch, Debdale, Hunt, Robert Catesby were some the recruited members of this secret society of gunpowder plotters who’s base was Hoghton Tower. Many were Lancastrians. All roads lead to Hoghton Tower. In his book Shakespeare: The “lost years”, Ernst Honigmann revealed to the public a theory – first proposed in 1937. That the dramatist William Shakespeare spent some early years in Lancashire, as a servant in a chain of Catholic households; and that he is identifiable with William Shakeshafte, a player kept by the Hoghton family of Hoghton Tower near Preston. The theory now appears to be substantiated by the discovery that John Cottom, Stratford schoolmaster from 1579 to 1581, who was William’s teacher, belonged to the secret Lancashire gentry who were relatives and clients of the Hoghtons. But no one has been able to explain is what tied Hoghton Tower to Stratford (a little midland town where Shakespeare was from) and why, if Shakespeare was Shakeshafte, it should have become such a secret. The reason they were not able to do so is that no one explored the Catholic context. 10 years age, Ernst Honigmann, did in his book. It is infact a famous Jesuit mission in the winter of 1580-1 which connects the two places. It provides the answers for Shakespeare’s “lost years”, and suggests a solution to the mystery of Shakeshafte’s vanishing. In 1617, King James I while staying at the tower, was so impressed with the loin of beef he was served here, that after a few drinks he took his sword and knighted the meat thereby giving the name to sirloin steak! To remember the event the local pub was renamed “The Sirloin” and still goes by that name today. Sir Richard de Hoghton was forced to entertain the King for three days at great expense. Unfortunately this left him penniless and he was sent to prison due to his debts.